♦ Concerns about human rights. ♦ Draft of the “conscience concordat” (2004). Church in England, October 2008. When human rights conflict with Catholic doctrine, the Church tries to ensure that its own rules have precedence. Concordats can help accomplish this. Through concordats the Church attempts, wherever possible, to build its doctrines built into countries' constitutions and national law, even when this violates human rights. For example, the Constition of the Dominical Republic now effectively bans abortion, while concordats in both Brazil (art. 13) and Germany (art. 9) uphold Catholic confessional secrecy. It has been a continual struggle to get even many countries that have signed international human rights treaties to actually incorporate these rights into national law where they can be enforced. 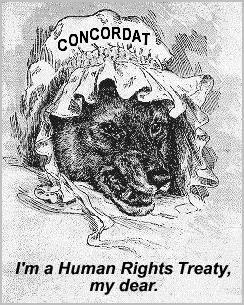 The cruel irony is that the Vatican styles its concordats as international human rights treaties. Even where the law doesn't give Catholic doctrine precedence over human rights, the cultural influence of the Church can do the job. As Elizabeth Prochaska, barrister and founder of Birthrights Ireland, said, “Savita Halappanavar’s death shows how a system which ostensibly permitted abortion to save the mother’s life failed to protect her from the conscientious objection of her caregivers.” And Ireland, where Savita died needlessly, is not the only European country where a doctor's right to conscientious objection can trump a woman't right to life. According to a complaint accepted by the Council of Europe in 2014, the government of Italy has also failed to ensure that women can get the abortions that they are entitled to by law. It has not guaranteed the adequate presence of non-objecting medical personnel in all public hospitals. In Italy desperate women are facing an increasingly more difficult search for help. And in 2014 in Poland 2.5 thousand doctors (and counting) made an online pledge to adhere to Catholic doctrine. This indicates that they are not willing to perform even those abortions which are still legally allowed, in defiance of the European Court of Human Rights. The doctors declared that they "recognize the primacy of God's law over human law". So much for human rights! And in the US clinics offering contraception and abortion are being subjected to terrorism. The attackers justify their actions by comparing abortion to the Holocaust — an idea first put forword in 2005 by Saint John Paul II. In much of the developing world it the situation is also dire. There "faith-based organisations" (FBO) use government money to provide much of the health care and many of them offer only the services they approve of to only the people they approve of — in clear violation of human rights. Watch the video on how this works, Development Aid: What You Need to Know and read the report from Catholics for Choice. Women, of course, are not the only group to suffer disproportionately from Vatican doctrines. Catholic gays continue to suffer under Pope Francis, as the editor of a gay newspaper points out. In fact, an explanation of the context of his famous remark, suggests a less liberal interpretation of his famous comment, “If a person is gay and seeks the Lord and has good will, who am I to judge?” This turns out to have been part of the pope's refusal to let a trusted aide, Monsignor Battista Ricca, be ousted by elements in the Curia who were trying to block Francis' reforms. This remark, therefore, seems to be less about gays per se than about asserting papal power. And in places like Africa, where Catholic Church is growing fast, the position of gays is tragic. As many as 36 African countries have laws against homosexuality, and tolerance of gays is widely seen as "Western colonialism". According to the sociologist of religion, Philip Jenkins, if the African churches were to soften their stance on gays, "Catholic leaders say they would just seem to be selling out to the West, betraying African values and just giving the whole thing to Islam". In Russia the Vatican-Orthodox alliance to boost population faces a problem in clamping down on contraceptives and abortions. The Russian health system still ensures access, and women regard this as their right. With few private clinics, the US activists’ strategy of legal harassment and intimidation won’t work. So a bottleneck had to be introduced into the state hospitals. “Abortion counselling” has been designed to make women feel like murderers. The real target of the Vatican's anti-abortion campaign is family planning. The Vatican defines any reliable method of contraception as either "abortion" (the pill) or as "anti-life" (condoms). It's a fancy theology of unrestricted breeding. Yet it didn't have to be this way, and in the 1960s it even looked as if Catholic theology would be interpreted to allow the pill. After convincing the Evangelicals to join its pro-life campaign, the Vatican has managed to get the Orthodox Church on board, too. The Orthodox Church is the world’s second largest Christian communion after the Catholics. And the one-time communist KGB agent, Prime Minister Putin, has also signed on to the Vatican population policy. This page gives background for How anti-contraception groups hijacked the Russian health service. The Vatican does a tapdance around human rights. It doesn't dare reject them outright, so tries to change them to suit itself. It denies women's right to reproductive choice and gays' to marry by dismissing them as “gender ideology”. At the same time, it inflates the right to conscientious objection and extends the definition of legal personhood in order to threaten access to contraception and abortion. What if a club said: "The whole world should join us, and enrol children before they are old enough to decide for themselves. Furthermore, a women must produce the maximum number of new members, even if this kills her. After all, her body doesn't belong to her. It belongs to us." ...Naturally, people would see this as a power grab, so that such a club could not possibly exist. Or could it? The Vatican signed this United Nations treaty to protect children, but added a reservation that says it can only be applied in line with Church teaching. However, when this made it sound as Church doctrine permitted worldwide child abuse, the Vatican changed direction. Now it says its signature only commits it to protect the children in the (virtually child-free!) Vatican City. The Vatican doesn't acknowledge human rights unless they are in accordance with Church doctrine. Its courts have been found by the EU to violate the right to a fair trial. And the Vatican has even maintained that its signature to one of the few human rights treaties it has signed (and even then with “reservations”) only applies to its own territory and not to the Catholic Church. The Vatican forbids birth control and abortion services in Catholic hospitals and tries to prevent them being offered elsewhere. In 2018 the Trump administration created a special office to protect healthcare workers who refuse to treat people on religious grounds. The Church even tries to get the United Nations and national governments to cut off funding for birth control and abortion to competing clinics. This profitable worldwide strategy has seen Catholic bishops lobbying to ban abortion providers in the US from any government funding.